Huge Savings Item! Save 12% on the Sedinaag Series Hanging Box/file Pedestal, 15-3/8w X 22d X 19h, Espresso By: Alera by Office Realm at Momiji Studios. MPN: ALESE551622ES. Hurry! Limited time offer. Offer valid only while supplies last. A contemporary classic with clean lines and modern silver metalwork. Thermally fused woodgrain laminate is scratch-, dent- and water-resistant. A contemporary classic with clean lines and modern silver metalwork. Thermally fused woodgrain laminate is scratch-, dent- and water-resistant. Drawers operate on steel ball bearing full-extension glides. File drawer accommodates letter/legal filing. Central locking with two fold-away safety keys for a slimmer profile. Not freestanding; mounts under any credenza or return. Color: Espresso; Overall Width: 15 3/8"; Overall Depth: 22"; Overall Height: 19". 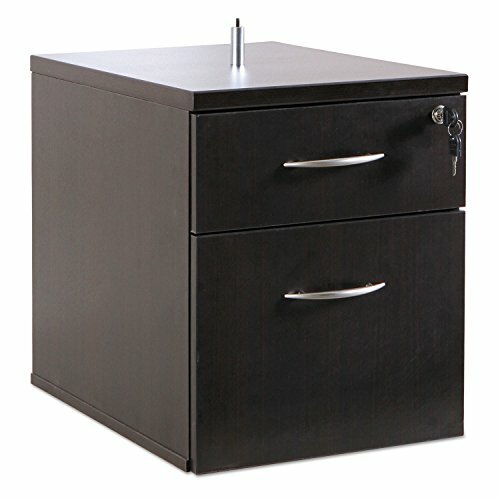 Safco - Five-Drawer Steel Flat File 53-1/2W X 41-1/2D X 16-1/2H Tropic Sand "Product Category: Office Furniture/File & Storage Cabinets"